We gave away Pepper because he was a rooster (our city allows hens but not roosters). Salt was really upset and lonely! But we gave him to an animal shelter and he is in their petting zoo because he is so nice! The animal shelter is by our house too so we can go see him. We got new chickens! Mini and Charlie are their names! 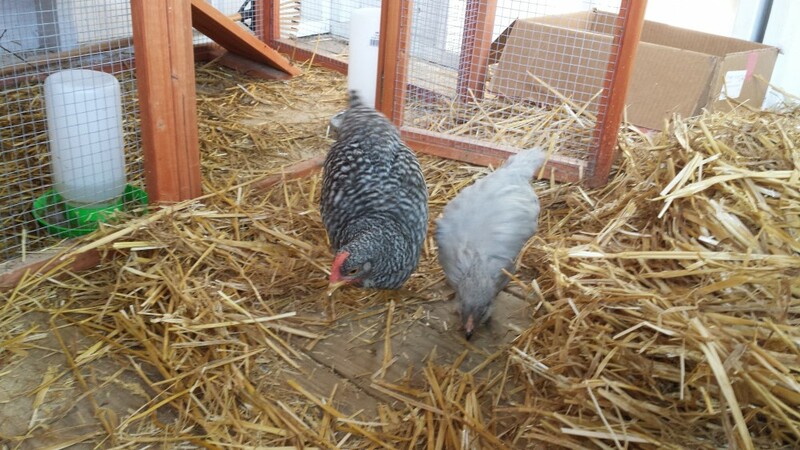 Mini is a Barred Rock (just like pepper) and Charlie is a Buff Orpington. They were born in August and they are 4 months old (we got them when they were three days old)! Salt layed an egg! Yes, she finally did it! It is blue/green, not because it is disgusting but because she is an Easter Egger (the mutt of the chicken world) and they lay all different colors, some even lay gold! We have 7 total now and gave 3 away to some friends. If any of you have chickens please comment so that I know I can move on with my tips and info! Thank you! Sorry about not posting! I just started 5th grade so its kind of hard to fit it in with all the studying, homework, and sports! My next post, which I am posting right after this one is going to have some updates and info about my chickens and yours. Very, very, very sorry again! Hey, my friend dropped off her chicken a while ago and I remembered something. Not all chickens are friendly toward new people or other chickens. Her chicken (it’s a rooster) is not that friendly toward me or my chickens. Of course, my chickens are always around other chickens so they were trying to be friendly. But he was not. And he started to attack mine. I got really scared and started to freak out. I started to shew (never ever do that), and all sorts of things. Finally, I got him put up. But then I felt bad because he had such a small cage for a chicken. So now we take them out at separate times. Never do what I did and let them out together right off the bat. Let them get used to company. How am I doing? Comment any questions or problems and I will either comment back or post about it! If you see your chickens on the ground kicking up dust and all twisted up, don’t be scared and freaked out like I was. They are only dust bathing. Dust bathing helps get chickens clean, I know you are probably thinking ‘What? Chickens bathing in dust? Doesn’t that get them even more dirty?’ No it doesn’t, it cleans them. My chicken, Salt, looked like a snowball afterwords, so it gets them pretty clean. Also they seem to have a ball doing it too! Sorry about not posting that much, I was on vacation. Here is a tip about when you go on vacation. Don’t just give them a lot of food and water, you need someone responsable to take care of your chickens (especially when they are almost grown or grown) because they need to have some time to play and have fun. I ALWAYS have someone take care of my chickens. Now that I think about, I always have someone take care of them whether they are grown or not. I hope this helps you like it helped me!